In which Sev isn't super enthused about books. As always, you can see progress shots of the making of this page when you vote for Runewriters! Can't he just make more runes? I was under the impression they could be written on pretty much anything. The tentacle hands seem to make writing difficult. And other things as well. 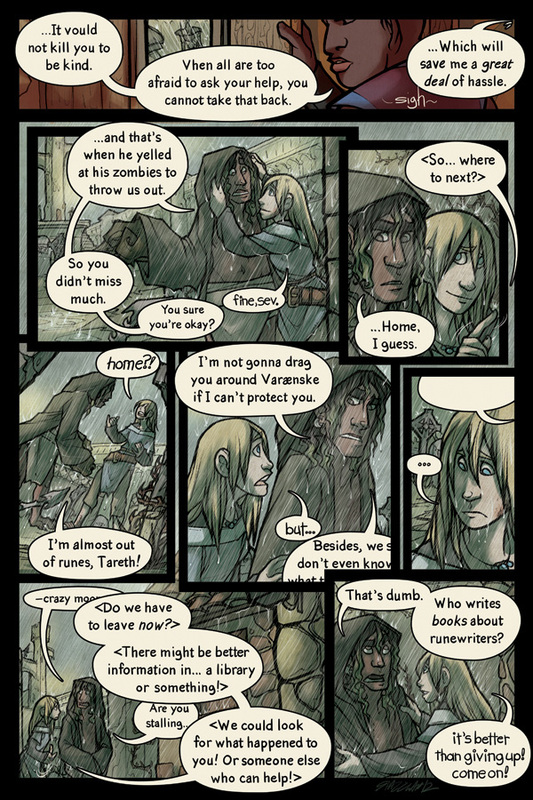 Love how Sev's speech bubble is empty because Tareth isn't looking at him. Great touch, Shazz! A runewriter could write books about runewriters! How does he know no one does? He just doesn't want to step into a library and do some learnin'! Ahahaha! THIS DIDN'T EVEN OCCUR TO ME but now I seriously gotta use a screencap of that panel whenever I end up making RW books. Giant owls are bad news. The rain is beautiful and tareth looks so cute trying to cheer up sev.